By bus from Thirunelveli and Vanamamalai. Thirumangai Azhvar ascended to His abode from here. Thirumangai Azhvar thiruvarasu is present in the fields near the town. 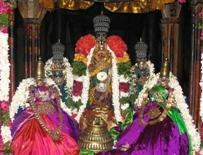 Sannidhis for Shiva and Bairava between Ninra Nambi and Kidandha Nambi sannidhis. Ramanuja sannidhi near the Thirupparkadal river at a place called Thirupparivattappaarai. Nampaaduvaan event occurred in this divyadesam.